And the DIPS have it! What would any gathering be without dips (I am talking about food ; )). Sure the Meat is the primary main course, but before you get there, something has to help those veggies go down. It’s like a good salad – I eat it for the dressing. At a party – we eat the veggies for the dip. Otherwise, it’s just eating spoonfuls of dressing and dip. That’s not right, right? Below are a few ideas for dips to serve. You can have just one or multiple – it’s all up to you. The below are some of my favorite, however, there are plenty out there and if you have sour cream, mayo or creme fraiche – anything can be turned into a dip. I do not go into a ton of detail for the dips, mainly list the ingredients. The instructions are more or less – mix all together. Let us get this party underway! Whisk the Lemon, Lime juice, Vinegar, garlic, Olive Oil, salt and pepper. Put aside. Mix all together. Or pulse in a food processor/blender. Taste and adjust salt/pepper as needed. Brown the hamburger on the stove in a large sauce pan. Drain off the extra fat. Add the onions, garlic and Jalapenos if using. Stir add cook until the onions are translucent. Add in the salsa and cheese. Continue stirring over reduced heat until the cheese is melted. This dip will burn if left unattended. 1 can chick peas ( 16 oz) – 2 cups if you make yours from scratch. Reserve the liquid. Place all in a food processor/blender and pulse a few times before blending on high. You want a nice smooth texture. Taste. You may need to add some of the chickpea liquid or more olive oil if it’s too thick. 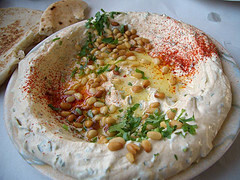 Serve with fresh vegetables and/or pita bread. Optional: Top with fresh extra virgin olive oil just be for serving. Serve with fresh vegetables or use as a base for a creamy sauce. Taste and adjust salt/pepper as needed. Serve with fresh vegetables. Put the avocados into a bowl. Mash them with the back of a fork or spoon. Leave as chunky or smooth as you wish. Stir in remaining ingredients to combine. Ok – we are going to do this one with pan-roasted corn and some southwestern zing. In a large cast iron pan (cast iron was made for cooking corn, but if you don’t have one use whatever saute pan you have about 12 inch), add the olive oil and heat until the oil starts to simmer. Add in the corn and cook stirring occasionally until over done (about 10 – 15 minutes). You want it to “char” a little on the outside. It will also shrivel a bit. This is ok, it will be nice and sweet. If you don’t like it that way – then stop the cooking process when you like it. Once the corn is done to your liking, add in the garlic, onion, peppers, celery, beans and season with the chili powder, cumin, celery salt, cayenne pepper and fresh ground black pepper. Saute for just a couple of minutes. You still want the veggies to be firm. Don’t for get to taste before adding more salt. Taste and adjust with seasoning if needed. This recipe can be used as a dip, spread (reduce the amount of sour cream and cream) or filling for pasta (like stuffed shells). You can also add any other fresh herb you have on hand – thyme, oregano, chives, scallion, etc..
** Note – the parmesan cheese will add salt, but the mozzarella and cream will absorb salt. So wait until the end to add salt. Add all ingredients (except salt) to a food processor and puree. Taste – adjust with salt/pepper as needed. Hopefully these ideas will assist at your next gathering or just snacking on. Posted by culinaryease on January 16, 2011 in General Cooking, Parties, Appetizers, and More, Recipes, Vegan/Vegetarian and tagged dips, Hummus, Vegetable.